There are two DALI lighting control system power supplies; one for in-line mounting and the other for DIN rail mounting in a DIN rail enclosure. • DM-SL-PSU is an in-line 200mA DALI power supply. 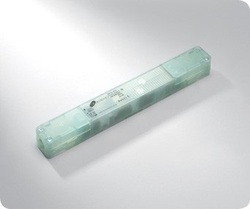 • EBR-DIN-PSU-DALIG is a DIN rail mounting 180mA DALI power supply.